Hi All, my daughter has moved out and after spoiling her with our Rocket lattes every morning, she is expecting an espresso machine for her birthday. Any advice please on an economical machine on the market that she can make do with? Thanks in advance. Last edited by Monica54; 16th March 2018 at 12:49 PM. bosco and Dimal like this. BES 870 Breville Barista Express. For me that would be her best entry point. Bypass the pods and pressurised baskets and start her on the right road, she'll learn. At the moment Harvey Norman have a Black Tag Friday sale on. Based on my experience and numerous posts, BES870 only if extended warranty is purchased as well. I must have been one of the lucky one's, or unlucky. Paid for a never needed extended warranty and it's still going strong after 4+ years. I'm wanting to upgrade now, but its served me well. Could she make the latte on the rocket herself? Last edited by Jackster; 16th March 2018 at 11:49 PM. 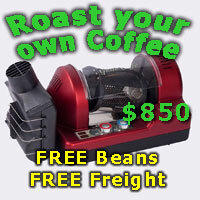 are you thinking $300, $700 or $1500 for machine and grinder? Have to be new or second hand okay? Agree with the comments on pod machines, but, it does all depend. If she wants to become a genuine coffee snob then no to a pod machine, if she likes real good coffee, no to a pod machine, but if she wants a quick cup, better than instant, then maybe a pod machine. I have one, it has a place, but my preference is for an EM6910/EM7000 with an EM480 grinder, VST baskets and a naked portafilter. Well if she wants a quick cup better than instant, she might as well get a drip machine, definitely not a pod. They are very cheap can be picked up for less than $70 new and very cheap at op shops. They make nice coffee providing you use fresh beans. I even use Lavazza preground and that's acceptable too, better than instant. There is a general dislike of filter coffee with the Australian public and yet they'll go crazy for Moccona $20 plus for a big one. The only useful thing about it is you do end up with a decent storage jar. To be perfectly honest, there are many paths that lead one to the enjoyment of wonderful espresso at home. One that has only recently made my life more enjoyable, is the acquisition of a Flair Lever Espresso device. JetBlack_Espresso, samuellaw178, bigdaddy and 1 others like this. Agreed Mal, the flair does a pretty good job. Also, given the OP has posted in the sub $500 forum, maybe a second hand Silvia with warranty? How about the $150 Aldi italian pump espresso machine. Have no idea how good or bad it is. No one has ever admitted to having one.